Background: In recent years, the management of acute myocardial infarction (AMI) has been the subject of many clinical trials. These studies have clearly established the value of using pharmacological agents, including aspirin, â-blockers, thrombolytics and angiotensin converting enzyme (ACE) inhibitors. There have been suggestions, however, that practice has been slow to change in light of the findings of these trials. Aim: To review cases of AMI at the major teaching hospital in Tasmania, Australia, to determine whether the recommendations from the results of the trials had been translated into local clinical practice, and to examine temporal changes in drug usage and clinical outcomes. 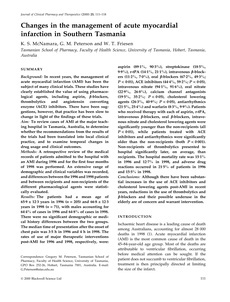 Methods: A retrospective review of the medical records of patients admitted to the hospital with an AMI during 1996 and for the first four months of 1998 was performed. An extensive range of demographic and clinical variables was recorded, and differences between the 1996 and 1998 patients and between recipients and non-recipients of the different pharmacological agents were statistically evaluated. Results: The patients had a mean age of 65·9 ± 12·3 years in 1996 (n = 205) and 66·8 ± 12·3 years in 1998 (n = 71), with males accounting for 64·4% of cases in 1996 and 64·8% of cases in 1998. There were no significant demographic or medical history differences between the two groups. The median time of presentation after the onset of chest pain was 3·5 h in 1996 and 4 h in 1998. The rates of use of major therapeutic interventions post-AMI for 1996 and 1998, respectively, were: aspirin (89·1%, 90·3%), streptokinase (18·5%, 9·9%), r-tPA (14·1%, 21·1%), intravenous â-blockers (11·2%, 7·0%), oral â-blockers (67·2%, 49·3%; P < 0·01), ACE inhibitors (44·4%, 59·2%; P < 0·05), intravenous nitrate (94·1%, 91·6%), oral nitrate (22·9%, 26·8%), calcium channel antagonists (19·5%, 35·2%; P < 0·05), cholesterol lowering agents (26·3%, 40·9%; P < 0·05), antiarrhythmics (21·5%, 25·4%) and warfarin (8·3%, 9·9%). Patients who received therapy with each of aspirin, r-tPA, intravenous â-blockers, oral â-blockers, intravenous nitrate and cholesterol lowering agents were significantly younger than the non-recipients (all P < 0·01), while patients treated with ACE inhibitors and antiarrhythmics were significantly older than the non-recipients (both P < 0·001). Non-recipients of thrombolytics presented to hospital significantly later, on average, than recipients. The hospital mortality rate was 15·1% in 1996 and 12·7% in 1998, and adverse drug reactions occurred in 21·5% of patients in 1996 and 15·5% in 1998. Conclusions: Although there have been substantial increases in the use of ACE inhibitors and cholesterol lowering agents post-AMI in recent years, reductions in the use of thrombolytics and â-blockers and their possible underuse in the elderly are of concern and warrant intervention.